The following article appeared in The Topeka State Journal, (Topeka, Kansas), on July 18, 1896. Men of science rom all parts of the world will show the possibilities of aerial navigation. Folks afflicted with the balloon fever will have a chance to indulge the disease to the uppermost limit before long. An aeronautical convention, the very first of its kind, is to be held in Boston in the early part of September, and flying sharps from all parts of the world will attend to show their fellows what wonderful things they have accomplished in the matter of touring among the clouds. It is almost unnecessary to state that this convention may be the means of causing a revolution in the matter of quick transit. 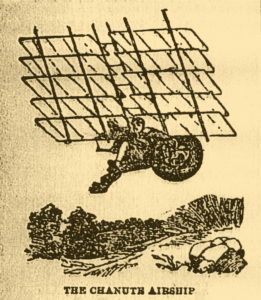 The men who will attend it are not reckless, untutored spirits; on the other hand they are intelligent scientists who believe that aerial navigation is not only possible but that within a few years it will be a popular reality, indulged in by great financial corporations and by private individuals. Popular interest in aeronautics has been aroused all over the world by the balloon expedition to the North Pole by Explorer Andree. recent experiments by meteorological experts in kite flying have also excited the public mind in the matter, and it is fair to presume that when the famous aeronauts convene at Boston their doings will be heralded to all the ends of the earth. The convention has been arranged by the Aeronautical Society of Boston. This is composed of only twenty men, but each one of the twenty is a man skilled in the work of the organization. The society was only formed in May of 1895. Professor William H. Pickering, the astronomer of Harvard College, is the president. He has taken up the study of aeronautics for the purpose of furthering the science of astronomy, believing that the scope of the latter will be enlarged to a limitless degree when astronomers are able to sail above the clouds. The best known of the scientists who will attend the convention are Herr Otto Lilienthal, of Berlin; Willis L. Moore, Chief of the United States Weather Bureau; A. S. Potter, also of the Weather Bureau’s staff; William A. Eddy, whose many experiments in kite flying have made him famous; J. Woodbridge Davis, inventor of the life-saving kite; Octave Chanute, who has been a recognized authority on flying machines for more than fifty years; Professor S. P. Langley, director of the Smithsonian Institution; Gilbert T. Woglom, of New York; Alexander Graham Bell, of telephone fame, who within the past year or two has given much time to the study of aerial navigation, and possible Laurence Hargrave, of New South Wales. Much of the work for the convention arrangements have fallen upon Albert A. ????? will probably take place at Milton, a suburb of Boston. The reason of the selection of Milton is that there is a fair sized sheet of water near at hand. All aeronauts have a weakness for making ascents in the vicinity of water. Experience has taught them that it is pleasanter to fall a few hundred feet into deep water than to smash into the earth. It is quite probable that if no water were near at hand many of the designers would refuse to show off their flying machines at the competition. Prize A – For the kite showing the maximum of lift to the minimum of drift in a breeze having a velocity of more than fifteen miles per hour. Prize B – For the kite showing the maximum of lift to the minimum of drift in a breeze having a velocity of less than fifteen miles per hour. Prize C – For the kite keeping its equilibrium through the greatest extremes of wind velocity. Prize D – For the soaring machine of free flight which, after gaining velocity, shall make the best course. The excellence of the course to be judged by the maximum length and the minimum of undulation. Energy may be given to the machine by carrying it to a height. Prize E – For the best self-propelled machine. The great interest will center in the flying machines, and according to experts this feature of the program will be a duel between the designs of Professor Langley, of Washington, and Herr Lilienthal, of Berlin. 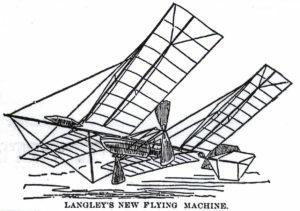 Professor Langley’s machine is a contradiction of the principles recognized by all of the other designers of flying machines. In other words, the aim of the average designer is to produce a machine lighter than the air. Professor Langley believes that the weight of the machine has nothing to do with its flying capacity. He claims that the great essential is the driving force. If enough power can be introduced, he argues that a machine of any weight can be driven through the air. Professor Langley has been most reticent about the construction of his machine. He uses steam as a driving power. It is in the distribution and form of the solid matter, he says, which allows it to float through the air, and the greater the speed attained the less danger there is of the machine falling. Less than three months ago Professor Langley sent a small machine on a flight of nearly half a mile through the air in the presence of Alexander Graham Bell. The machine was built of steel, weighed 24 pounds and measured 14 feet from end to end. It was 1,000 times heavier than the air supporting it. Great secrecy attended the experiment, and the world would probably have never known of it had it not been for the enthusiasm of professor bell. Professor Langley is now at work on a larger and heavier machine, in which the driving power will be much greater. It is possible that the new machine will be exhibited at the Boston convention. Professor Langley does not believe that man has sufficient strength to fly with artificial wings. His rival, Herr Lilienthal, does. His machines are constructed on that idea. 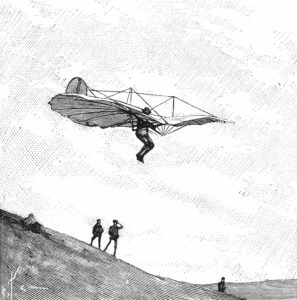 With the Lilienthal machine it is necessary to start the flight from a high hill. The flyer buckles on the machine, takes a sharp run and jumps into space. The big wings on the machine are supposed to do the rest. The novice, when he runs and jumps, usually hits the ground with his face. Herr Lilienthal has had an artificial hill fifty feet high built near his home at Gros Lichterfelde, a suburb of Berlin. From this eminence he has made repeated flights of 250 yards.